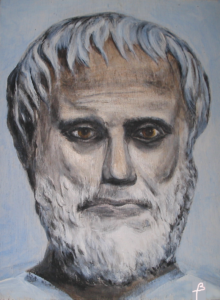 Aristotle is considered to be the first scientist. Considering humans´ limited understanding at the time he lived, the ways he changed the world are utterly unmatched. Not content to become an expert in only one or two disciplines of science, Aristotle was driven to find out about as much of the world around him as he possibly could. This included attempting to classify living organisms, the development of optics and studies of the earth to name just a few. Aristotle made observations about the world around him, attempting to document as much as he could. His work was used by later scientists to develop their own ideas. Much of his work was done in descriptive, qualitative way. Unlike modern scientists, he did not use many mathematical relationships to prove his discoveries. Much of this was due to the fact that simple tools for measurements did not yet exist, nor did many of the concepts required to fully explain his observations. Things that we assume as common knowledge today, such as mass, velocity, temperature and force, had yet to be discovered. Although most of Aristotle's ideas are now considered to be antiquated or even wrong, there is no doubt that if it was not for his work, subsequent scientists would have found it much more challenging to understand the fundamentals of science.